As many people with T1D in the UK will know, there has been an ongoing dialogue between NHS England and the DVLA with respect to allowing the use of CGM and Flash monitoring in determining glucose levels relating to driving. The consultation has been underway for some time, and appeared to be going well. Until recently, when it became clear that it wasn’t, and that objections had been raised to the introduction of CGM and Flash on “patient safety grounds”. Now you might expect that these would come from healthcare professionals or patient representatives, but no. They came from companies involved in the manufacture of diabetes products. So far, there are no official names, but we are raising a freedom of information request to look further into this. Then came the news from Partha Kar that a company had raised an objection to NHS England about the Libre announcement and was looking to challenge the entire process. An altogether more outrageous frontal attack intended to stop the NHS funding the Libre, because they didn’t have their own product that fitted in to the new guidance. Who might have the gall to do such a thing? Well a reasonably brief dig into the data suggests that it could easily be one of a number of companies. This and objections to the use of flash/CGM for driving are both identified in the blog. The latter is dealt with in the appendix to this page. According to Partha’s blog, there was a wider strategy to open up access to D-Tech, but one company blew that one open when they no longer played by the rules of the alliance. Libre was supposed to be be a pathfinder, but instead, in attempting to manage their bottom line, someone decided that Libre wasn’t good for patients and appears to have gone over the heads of NHS England’s Diabetes team. Let’s take a look at some data. If you take a quick look at the widely available NHS BSA prescribing data, you can arrive at some interesting conclusions very quickly. As shown in the table below, three companies control more than 55% of the strip market in England and Wales. One has more than a quarter. The one with more than a quarter of all strips is also the one with one of the most expensive strips, costing 32.42 pence per strip, that just happen to work in a bolus calculating meter that is given away on DAFNE. Overall, at a weighted average of 26.14 pence per strip, 60% of their sales are the most expensive ones. Given they have 28.4% of the market overall, this means that they still command the largest share of the market with a single product line (more than 17% with the Aviva system alone), which is also the most expensive strip on the list. Interestingly, the average cost for the second and third placed companies is roughly 19.9 and 26.69 pence per strip respectively, with the most expensive for the third place costing 30.08 pence per strip and accounting for 68% of their market share, or 7.8% of the overall market. The table below shows the total amounts of money involved annually, based on the prescription data that we have. Given the above, it wouldn’t seem too unreasonable, based on scale of sales to suspect that one of the top eight might raise an objection to something that would impinge on their sales, however we can probably exclude Abbott as they would be making money from the Flash business. I can even imagine the case that collusion might take place between companies to ensure a spanner is put in the works. But to use concerns about “Patient Safety” or “Patient Choice” as the argument rather than suggesting to the powers that be that they might lose money, as that might not go down so well with a government agency? One might consider that to be disingenuous. Why might one of the test strip companies want to raise a request to senior bodies of the NHS to stop Libre. Well let’s review what the plan is for Libre. Taking a conservative view, it’s to have 25% of those with T1D using the Libre on the NHS, and gaining significant quality of life and outcome improvements in the process. Which 25%? Well those who test in high volumes and those with high Hba1C values as a start (although NHS England’s guidance may change). So if you’re one of the big three and you can see this coming, you might look at that and think “25% of T1Ds going from 8 a day to 1 a day is likely to cost us sales”. If you are Roche, that could be worth the best part of £12,000,000. Overall, it would reduce the amount paid to test strip providers by around £37 million (regardless of the increased cost of using Libre). Now this fails to take into account the fact that most of those with Hba1C levels greater than 8.5% are likely to not be testing 8 times per day, but it doesn’t mask that there would be an overall impact on sales. Putting it bluntly, the strip units of these global companies are facing an overall reduction in their revenues of between 20% and 30% in the UK as uptake of flash gets underway. You can see why they might want to push any change back until they were able to compete, even if it is only a small part of their global revenue. You mentioned additional industry interventions? Ah yes, I did, didn’t I? Whilst all this was going on, from those who don’t have a CGM or Flash product, there was a direct approach to CCGs to try and increase options in respect of Flash. 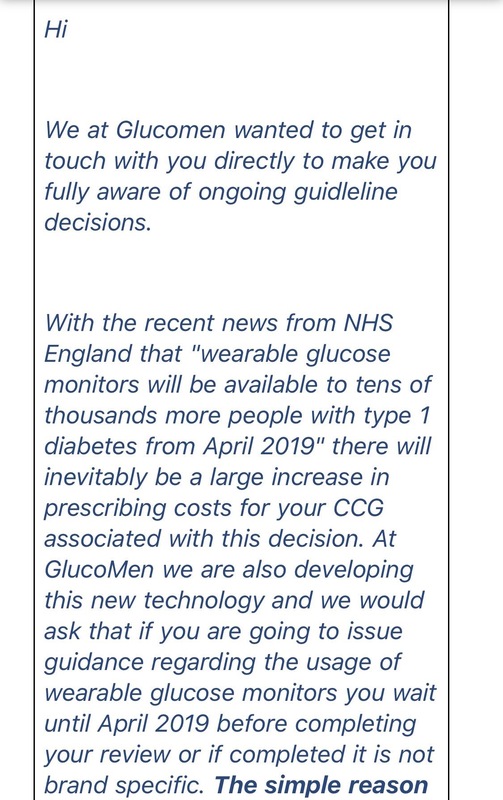 A letter came out from Glucomen, directly to CCGs, bypassing NHS England, that said they had something akin to flash and that it would appear in April 2019. 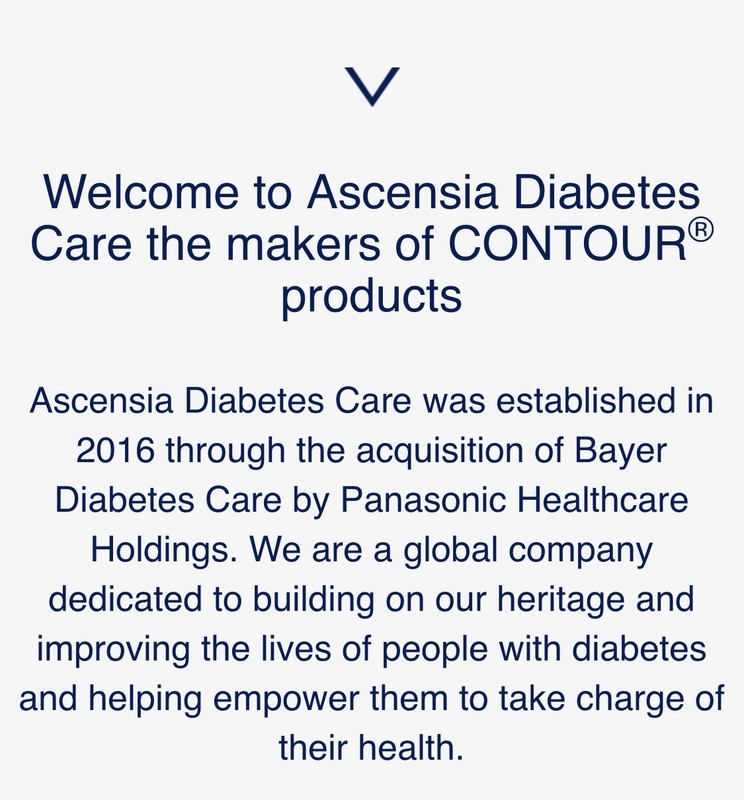 The initial commentary from the diabetes Healthcare world was “What is this?”. Glucomen had not been pushing a new CGM or Flash product, and there is little to no evidence of anything being available when you conduct extensive searches. There’s no evidence of ongoing clinical trials either, which would be needed for the NHS to fund something. In fact the only thing that shows up is the Glucomen Day, which dates back to 2010. Some suggested they may not understand the UK processes, as a company originating from Italy, however they’ve been in the UK market for 30 years so this seems a little thin. 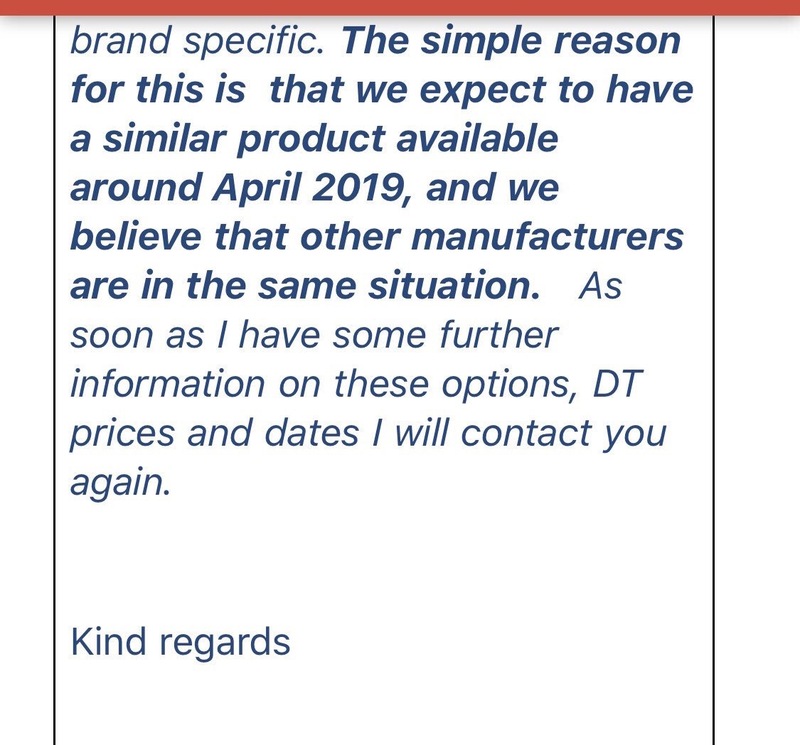 When this question was raised by NHS England directly they said that they do indeed have a product and it will be coming out in April 2019. Precisely when flash will be fully available under NHS England guidance. It is clearly an attempt to protect market opportunity where a company hasn’t yet got a product to market. Unfortunately it also ignores the fact that the only available data for a flash based system is all from trials with Libre, so the only option in April 2019 for a flash based system is Libre. Come forth with data and clear the air, or don’t obfuscate by going directly to CCGs. And yet… One could argue that the actions described earlier are all counter to the ethos of these statements. Surely, if you are a corporate that has a mission that puts the patient at the forefront of what you do (or even state that your aim is to help improve time in range, as Roche do), that must include improvements in technology that make living with a long term condition easier (e.g. Eversense). Even if it’s not yours. I don’t want to call the actions that have been described underhand, because they aren’t. They’re normal lobbying responses that corporates undertake when dealing with national bodies. I’m not going to judge whether they are right. They certainly leave a bad taste and they do seem to confirm an observation I heard from an industry insider who said that they’d never seen anything as “Wild West” as the MedTech industry. So if you feel that the costs of strips you are using are high, and you don’t use a bolus calculator, these are potential other options. One of the points raised in Partha’s blog were two objections on a recent DVLA consultation about using Libre and CGM for driving. What might the costs to these companies be of that? If we turn to the National Travel Surveys that the UK Government runs annually, we find some interesting pointers. According to the 2016 data, the average number of trips made as a Driver in 2016 was 389. 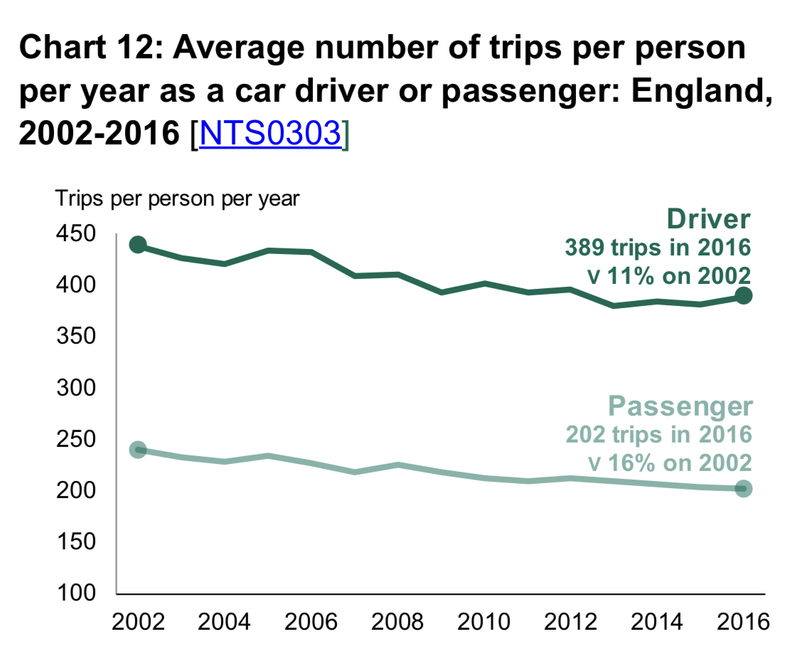 The 2017 data makes this information much more difficult to find, so for now we’ll use this number, as the change across all car trips from 2016-2017 is very minimal (591 in 2016 vs 594 in 2017). So from this we know that annually, at least one finger prick is required 389 times a year. The average journey length is relatively low, and there is no indication of how long someone stays at their destination, so we’ll use this as the basis of the calculation. The next thing we’d need to understand is how many people are driving. We can elect to use the number of cars or the number of people with driving licenses. Whilst 75% of the UK population holds a driving license, only 49% of the population could have been driving at any point in time given the number of vehicles available. So we’ll use that value and extrapolate it to the number of people with T1D. According to the JDRF, there are roughly 400,000 people in the UK with Type 1. Of these 29,000 are children, who obviously can’t drive. This leaves a population of 371,000. If we assume that 49% of these drive regularly, we have 181,790, who drive 389 times per year each. That’s 70,716,130 journeys, all requiring blood tests. Even if we assume only one test per trip, that’s still a lot of fingerpricking. Of those, based on the earlier data, 55% are done by the three biggest providers. Now we’re at 38,893,970 tests, and the weighted average cost of a strip across the top 3 is 24.48 pence per strip. That works out at a whopping £9,521,243. That’s what one strip per driven journey costs annually to the NHS. Now let’s put that into the context of the total spend with strip suppliers on the NHS. The total annual spend that was identified earlier for these three companies is some £86.3 million. On the basis of a single test per trip (which is likely to vastly underestimate the real “expected” use for driving), we looking at more than 10% of the overall revenue for these three companies alone being derived from the use of tests strips for driving. Given the push to get Flash out to 25%-30% of people with Type 1 on the NHS, and the assumption that a further 20% may be funding flash or CGM themselves, by allowing the use of these technologies for driving, there is a clear and obvious hit to the strip manufacturers. 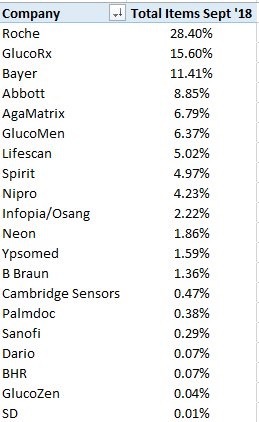 If 50% of people with type 1 were testing with Libre or CGM prior to driving, that would be a 50% reduction in strip revenues from driving, and we’ve already identified that this is an area worth an estimated 10% of the overall strip revenues for these companies. It amounts to at least a 5% reduction in strip revenues across the board, purely from driving, on top of the reductions in use (from roughly 8 per day to maybe one per day) that comes alongside funded use of the Libre. It’s clear why objections might be raised in a political forum in the guise of patient safety when faced with this sort of revenue impact. There in black and white are the back of a fag packet calculations that offer some potential reasons as to why companies might have objected. As a type 1 diabetic who uses the Libre with xDrip, I really don’t find it accurate enough for checking before driving, particularly if you’re aiming for gold standard and trying to keep within about 4.5-7.5 as much as possible. For me, there genuinely are safety concerns when using Libre for verification rather than trending information. Unfortunately, that’s the admission that would get a response of “Well you’re not using it properly” from Abbott, although a forthcoming post as a follow up on my use with MiaoMiao and xDrip will go into that. The reality is that the attempt to derail the wider roll out is the far bigger story in all of this. not disagreeing – but I’m not sure reading this that you realise that the majority of strips are prescribed for type 2’s, not type 1 (yes, we test more, but there are a lot more of them). That’s not the case. 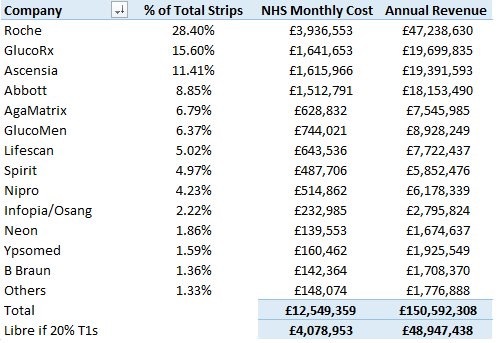 The number stated by Partha in a recent tweet for NHS spend on strips for type 2 was £15mn. That’s annually, given the total spend monthly within the NHS on test strips, and amounts to less than 10% of the total value annually. Type 1s are the largest users by quite a long way, and that ties in with the approach most GP surgeries take around offering test strips to type 2s. That was only for PWT2 who are on metformin alone or no medication, so low hypo risk. Many more PWT2 are on meds with higher hypo risk, where strip use is necessary. I don’t know what the total NHS spend on strips for PWT2 is. If that is the case, then it only makes the case against the company that objected to the Libre on cost grounds worse, as the potential loss to them is significantly lower. Good post. We in USA have been the recipients of some good news recently, as the FDA has loosened approval processes on CGM type devices and Glucose testers. These days, there are probably 3-4 “all-you-can-eat” subscription finger-stick services which serve as a revenue-cap for traditional pay-per-use models. As expected for our family- with the G6, fingersticks have gone to practically zero. So far, so good. Bottom line IMHO is that this is likely (hopefully) a bump in the road. 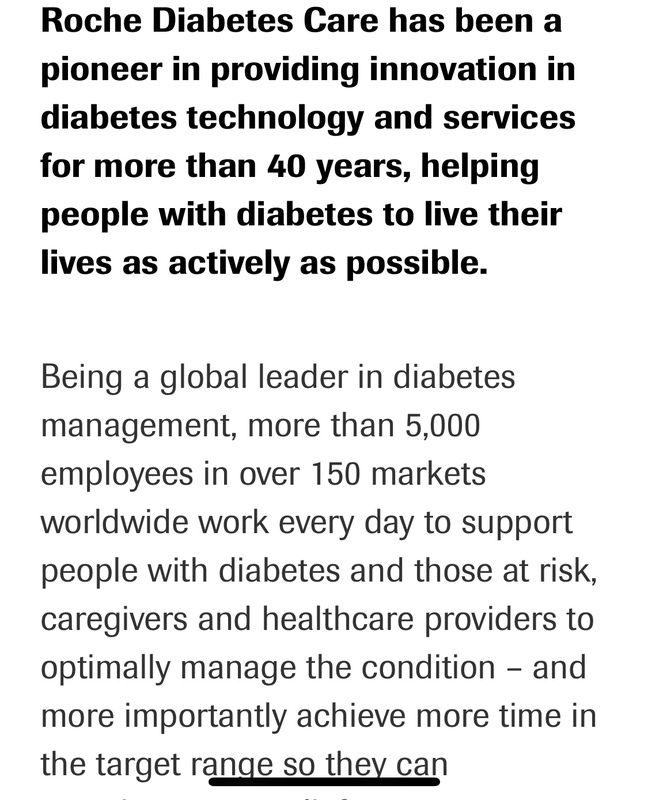 As anyone in the vinyl record business can attest to: “adapt or die” is showing early signs of cracking the Diabetes health care marketplace. As you say we are all different. Thank you for all the hard work and research and analysis. Being old and doddery I am left trying to grasp what the reality is. I gather DVLA will not be approving Freestyle Libre but I am not clear if NHS England are reversing their position on approving FSL from next April. Personally having used Libre with xdrip+ for a year I think it was a mistake to remove the ability to calibrate It frequently runs high sometimes low and rarely is spot on for the whole 14 days. However at hypo levels it so I still finger prick twice a day minimum and calibrate xdrp at least once every 2 or 3 days. However it is wonderful for improving Hba1c and for T1s with good warning signs is good enough. I don’t know the status with NHS England. I presume that there is some wrangling going on at the moment. I think the question of calibration is always going to be a challenge. For some it works well and for others it doesn’t, but the people who get some of the best results are those for whom not having to calibrate is a big thing, and who benefit enormously from not having to fingerprick. Does the UK or NHS (not sure about terminology) have rules for how often a diabetic person can get a new insulin pump? In the USA, that’s controlled by DME (durable medical equipment) Rules. Typically, a person in the USA can get a new pump every 4 or 5 years. That has the effect of locking people out of much needed technology improvements for years, particularly if they are using insulin pumps such as Medtronic that do not support software upgrades. Is the situation different in the UK? No. Globally, the pump manufacturers seem to operate a four year warranty system, whereby they recoup their costs through the consumables. I’m not aware of anywhere that doesn’t operate under a 48-month contract, although I’ve said on other media that what you’re purchasing from a pump company isn’t so much a product as a service, given the average life of a pump seems to be less than three years and it has to be replaced under warranty. Given that this model generates revenues in a much more effective way for sales people, but generates significant Capex for healthcare providers, I’d like to see a model where it is provided as a service and you get associated upgrades and improvements as you progress through your contract, potentially with an exit fee if the contract needs exiting early, and a trial period upfront. Ultimately, while pumps are medical devices, they cross over into a consumer realm due to how they are used and looked after, and the contracts would be better if they met that requirement. Very good post. Thank you very much for putting together all this information. Well done!! Self-monitoring of blood glucose is undertaken by 40% of the diabetes register. 15% of the 40% are T1s and 85% are T2s. T1s consume 35% of the test strips prescribed, T2s on insulin consume another 35% and the rest of test strips (around 30%) are consumed by T2 on oral meds or not yet on medication (diet and exercise). So, PWD on insulin (T1 or T2) consumed 70% of the test strips prescribed. On another note, basing your recommendations of test strips/meters for the UK market on data from the USA (i.e. test strips/meters available in both markets) doesn’t seem fair. There are very high quality (yet low-acquisition cost) test strips/meters available in the UK not being marketed in the USA. Hi Javier, thanks for the feedback. I’d be interested to find out where you got the data from for future use. The data you provide adds to the issues with a test strip company attempting to block the use of Libre if, as you say, the value is reduced by two thirds. This paints the company involved in a an even poorer light, as they are then blocking innovation for an overall cost that is now only a total of £12,000,000 or so, unless of course they have one eye on the future and are seeking to ensure that there is no carryover of Libre with insulin users to those with T2. I agree that the recommendations don’t seem fair, but as I’ve yet to see an independent appraisal of the accuracy of strips/meters that are available in the UK, it doesn’t make sense to make recommendations for “high quality, low cost systems” without having the associated independent accuracy data. https://www.therapeutics.scot.nhs.uk/wp-content/uploads/2018/03/Strategy-Diabetes-Quality-Prescribing-for-Diabetes-2018.pdf has a little on this at the end (as well as saying cost of strips is £20 million in scotland at the start – but again no time frame) – in glasgow you can see a drop in total cost of strips, when the health board brought in glucorx as the strip of choice, as being the most accurate over low and normal blood sugars, as well as cheap – unfortunately I can’t find the actual numbers for accuracy that were sent around. https://www.nhsggc.org.uk/media/237279/bgm_formulary_03161.pdf And yes, the company involved is in a very poor light. Thanks for that Jane. It does demonstrate that the cheaper strips do reduce costs. Unfortunately, none of the meters shown have bolus calculators, which is a driver for a fair number of t1s. It does surprise me how little public information there is on the accuracy or otherwise of meters. Call it the cynic in me, but when information like that isn’t in the public eye, I tend to be concerned about the reasonableness of it. Following the above comments about the accuracy or otherwise of glucorx I have had the following exchange with the Glucorx people. Can you quote me a MARD for the Glucose RX system? If so who carried out the evaluation? What evidence did your company have to present to the NHS regarding accuracy? 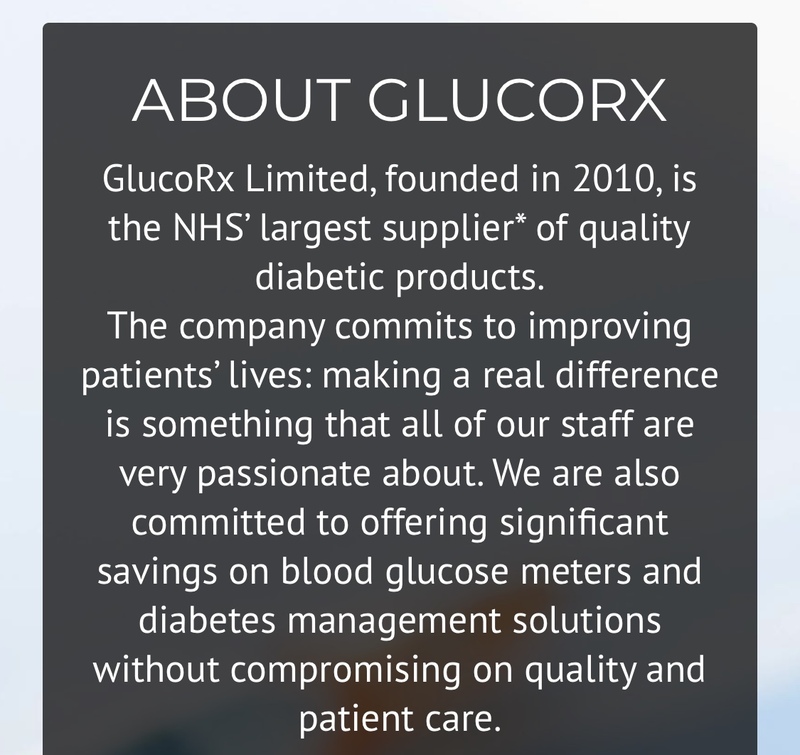 All GlucoRx meters conform to the system accuracy requirements of ISO 15197:2015. This standard states that 95% of meter readings above 5.55mmol/l would have to be ±15% compared with the reference method ‘YSI-2300 glucose analyser’. The YSI is the laboratory meter that all meters are calibrated to. From this I take that the minimum standard to to satisfy the above ISO is a MARD of 15 against the Contour Next which has a MARD of 5. The Nexus falls within this but there is no clue to whether it is just or well within. I read this to mean that if you get a reading of 6 mmoll/l then 95% of the time you will be between 5.1 and 6.9 mmoll/l. Tim are my above conclusions correct or am I over simplifying things?. Some of the them appear to show reasonably normal distribution while some show a bit of a skew, which makes it even harder to summarise roughly what the actual value will be and how frequently you’ll get it.